In the market for a new kitchen sink? 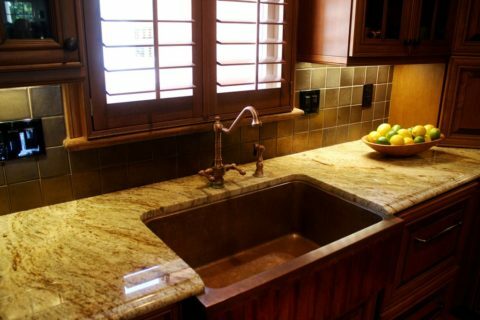 If you have a little bit of flexibility in the dimensions, capacity, and cost of your new kitchen sink, then you might want to consider a farmhouse sink (aka an apron front sink). If I, personally, had to choose one sink from all of the types of kitchen sinks available — it would be a farmhouse sink. The simplicity of a single, deep sink is very attractive. While there are double-basin farmhouse sinks as well, the extra large single-basin is the classic image of an apron front sink that most people think of first. It’s hard to imagine the humble beginnings of such a utilitarian plumbing device that would one day become one of the most sought-after kitchen plumbing fixtures for upscale homes. Obviously, you don’t need to have an upscale home to enjoy the benefits of a farmhouse kitchen sink. That just happens to be the type of new homes that I see them in most of the time when I’m out house stalking (exploring new homes under construction) and looking for new ideas for my own home. I’m going to share with you what I’ve learned about apron front sinks — so you’ll have a better idea of how to choose a farmhouse sink for your kitchen. There are a number of factors that will ultimately influence which type of kitchen sink is best suited for your needs and wants. This Kitchen Sink Selection Guide will help you decide which sink style is best for your particular situation — because there are pros and cons of farmhouse sinks. Yep, farmhouse sink sizes are fairly large… and plenty deep. Keep in mind — that translates into lost space below the sink! You should plan for having as little as 12 inches height of free space underneath your new farmhouse kitchen . 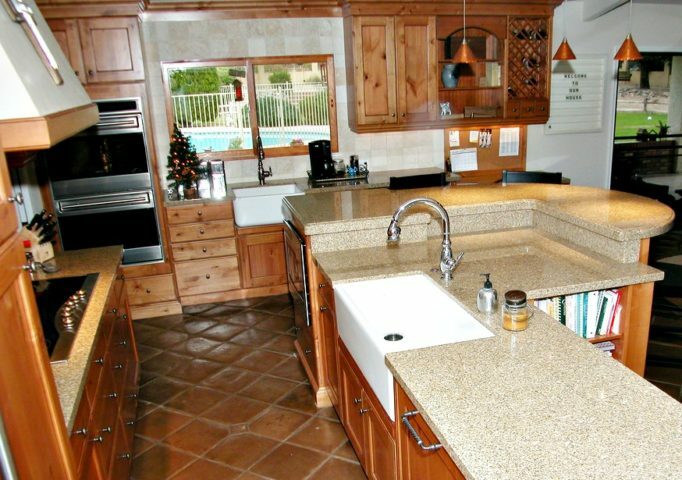 You might as well consider relocating everything that is currently under your old sink to a new location — to make room for the large size of a new apron front sink. Not only are farmhouse sinks deeper, they’re also wider. 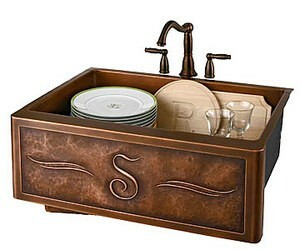 Farmhouse sink sizes typically range from 20 to 36 inches wide. So you’ll need to make sure your cabinetry can accommodate that. 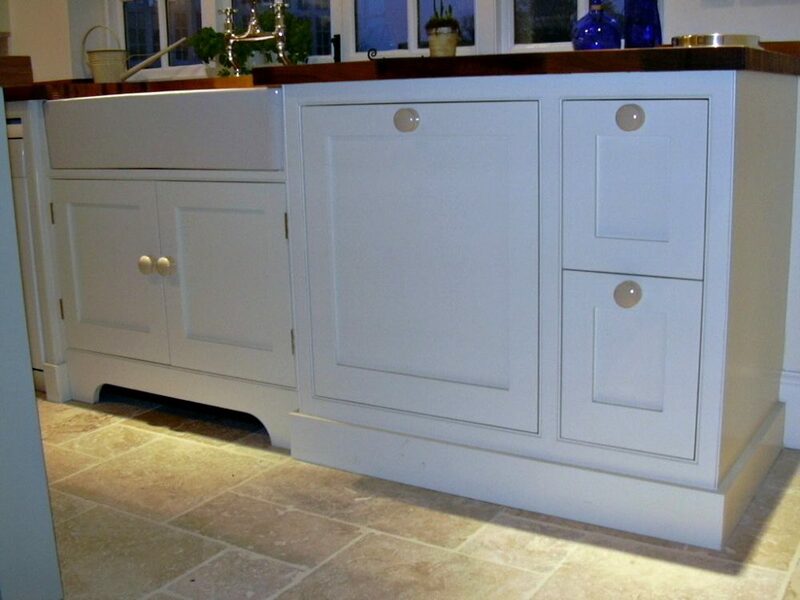 But if you’ve got the space for it, you can find extra large apron front sinks that are 60 inches long! When it comes to fitting a farmhouse kitchen sink into your cabinetry, it’s never an exact fit. That’s why your cabinet base should be wider than your apron front sink. 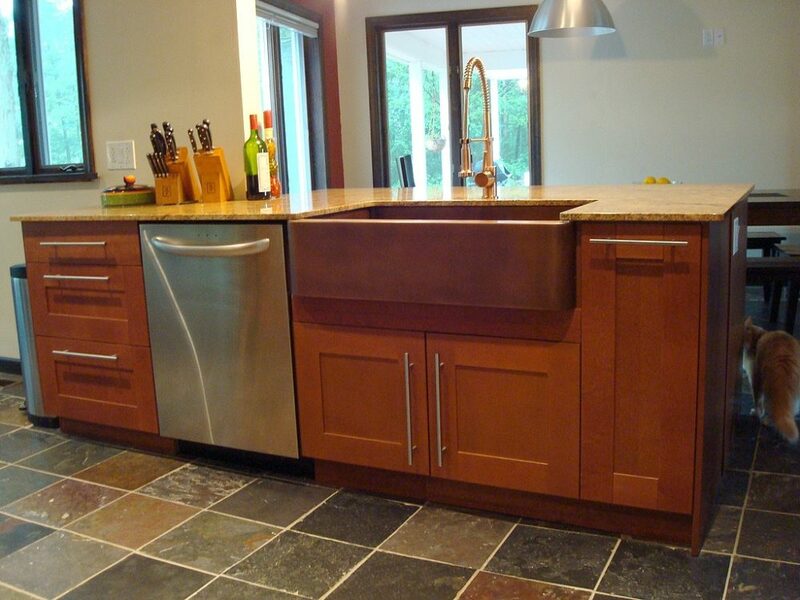 For example, a 30-inch sink will work well on a 33-inch or 36-inch cabinet base. Here’s how to measure for a farmhouse kitchen sink. You can’t just put a 100-pound sink where your old 20- to 30-pound sink used to be without framing modifications and expect it to be stable. You’ve got to bolster the framework surrounding the sink — based on the dimensions and weight of the apron front sink you ultimately choose. You’ll need to consult the manufacturer’s installation instructions and/or your contractor to ensure that proper bracing is built into the framework of your countertop. Here is a little bit of instruction on how to support a farmhouse kitchen sink. Deciding how much the apron front sink will protrude above the counter and in front of the counter are decisions that you will need to make prior to installation. Positive reveal – Most of the top flat edge is showing. Neutral reveal – The inside of the sink sits flush with the vertical edge of the counter. Negative reveal – The countertop covers the entire top edge of the sink. 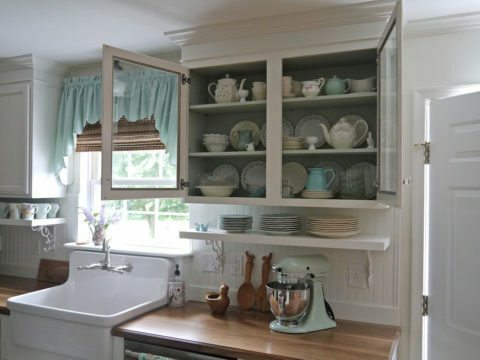 In the end, farmhouse sink placement is simply a matter of personal preference. Here’s a little bit more about all 3 types of sink reveal, as they pertain to an undermount sink. Again, farmhouse sink material basically comes down to personal preference and will ultimately determine the colors that you have to choose from. 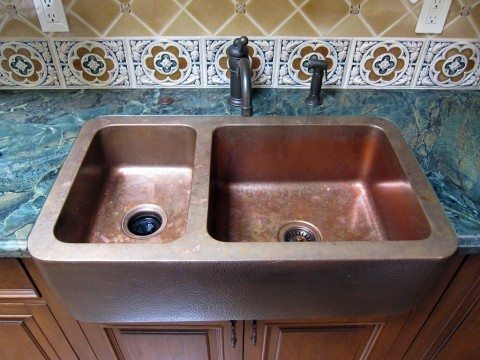 Here are some tips to help you choose the right materials for your farmhouse kitchen sink. Finally, the last — and perhaps most controversial aspect of kitchen sinks — is deciding between 1 basin or 2 basins. 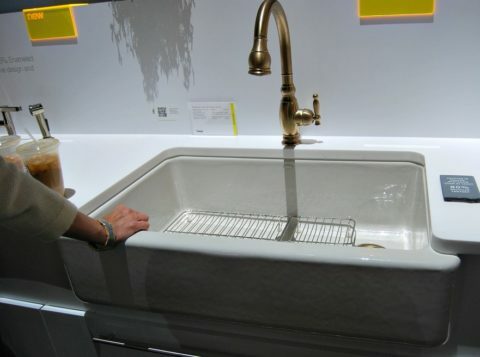 Of course, this factor isn’t unique to farmhouse sinks. Every new home builder must address this at some point in the process of designing the kitchen. You will find pros and cons on both sides of the fence regarding a single-bowl kitchen sink vs. a double-bowl kitchen sink. I found some helpful tips for choosing the right number of basins and the best shape for those basins on your new apron sink. There are a few more tips for choosing a double vs. a single sink in this video as well. Consider how you’ll use the sink — do you need a single-basin or double-basin sink? 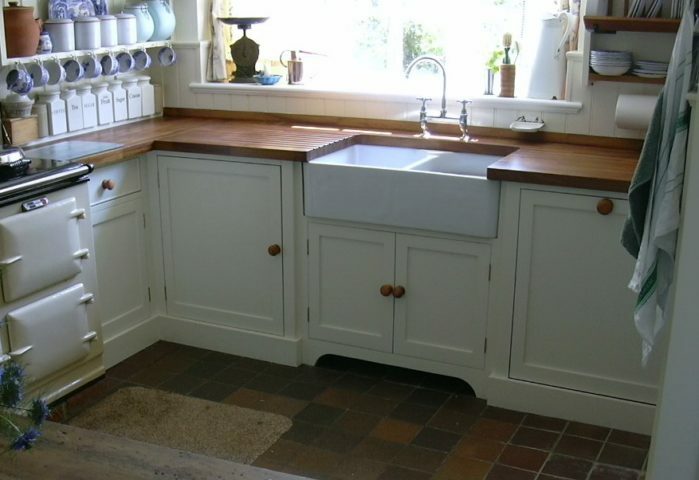 What type of farmhouse sink fits the style of your home best? In the end, when it comes to deciding on an apron sink… choose wisely! The farmhouse kitchen sink you buy today will probably last the life of the house.